What is the purpose of a journey? The literal definitions I most liked are: A process or course likened to traveling and passage or progress from one stage to another. The latter particularly spoke to my current state of being. Perusing the web on the subject of journeying, I find abundant reference to “Life’s Journey” and one’s“Inner Journey”. Both suggest a purpose of some sort - a broader discussion of which shall wait for a future article. As I have written in the previous months, my intention has been to travel the USA and Canada in my home on wheels. There’s a pithy saying that muses: “If you want to make God laugh, tell her your plans.” The chuckling is ringing in my ears as I type. attention. I viewed this last stop in CA as a perfect way to embark on my planned travel journey. What I discovered in San Diego is a place that speaks deeply to my soul – plus, it has opportunity for all of the outdoor activities I love virtually 365 days a year. I have parked the RV in a “long-term” RV community with intention to evaluate if San Diego is my future home. Hence, my journey has taken an unexpected turn. 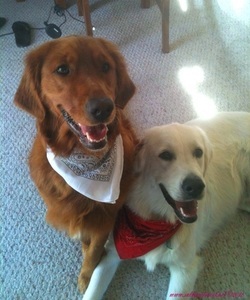 Dolce too has discovered pure bliss in the form of love for her new “boyfriend”, Lucky (a male English Cream Golden Retriever). The two of them have quickly become part of my daily routine in competition for my time on the bike or in the kayak. I regret not a minute of it! This being the case, the rest of my article focuses upon dog-friendly San Diego. I have to start with dog beaches! San Diego has designated three local beaches as off-leash dog playgrounds. My favorite is located on Coronado Island. The others are in Ocean Beach and Del Mar. As an eternal dog owner and beach lover, off-leash dog beaches are a dream. 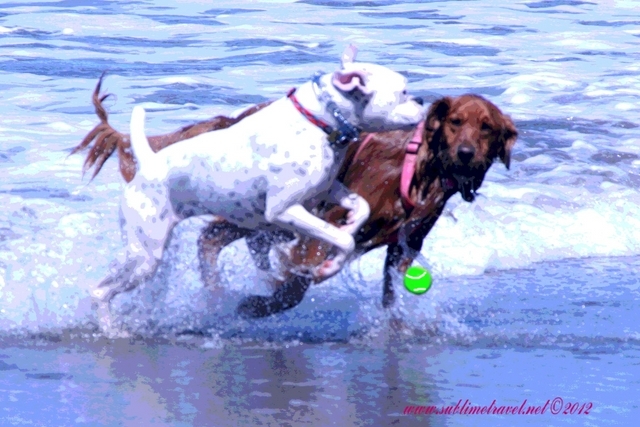 One should expect a healthy dose of exuberance leaning to chaos when visiting a dog beach. If you intend to lay out a blanket and have a picnic, expect sand in your food! It seems there is an unwritten dog code that no blanket shall go untrampled! My affinity for San Diego heightens each time I go to a public beach or county park and find signs declaring “dogs allowed” directly adjacent to dispensers filled with doggie waste bags! Fiesta Island, conveniently located near Mission Bay, is 5 miles in circumference and allowing dogs unlimited off leash freedom. several wonderful meals accompanied by Dolce and Lucky. Sushi may be enjoyed with views of the bay from Saiko Sushi on Coronado. Not only were the pups welcomed, they were served cool water and a biscuit! The fish was fresh, presentation was excellent and the company…well, who can resist two sweet golden retrievers? A few miles east of downtown nestled in the residential neighborhood of North Park; you Dolcewill find several dog-friendly dining options. We enjoyed burgers and ice cold beer at True North. Once again, dogs were treated like well-paying customers. At Station Tavern in South Park I counted more dogs than people on the patio! found some of the cutest fashions to go with my new SoCal girl attitude! beach region of San Diego.